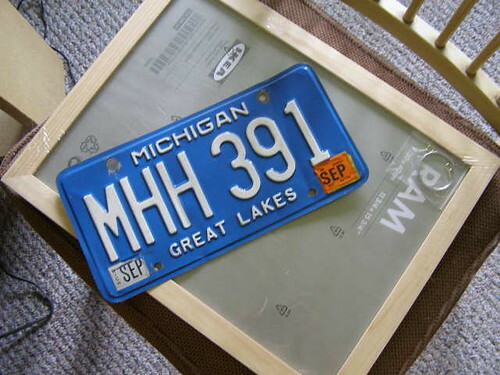 You may keep your blue license plate as a collectable. If you decide to dispose of it, please destroy it by cutting it in half or bending off a corner to discourage theft and fraud. Recycling might also be another option. Check with your local recycler for more information. This got me thinking. What could I make with mine? I’ve had that same plate since I bought my very first car seven years ago. The sollution? START CRAFTING. I decided to make mine into art. 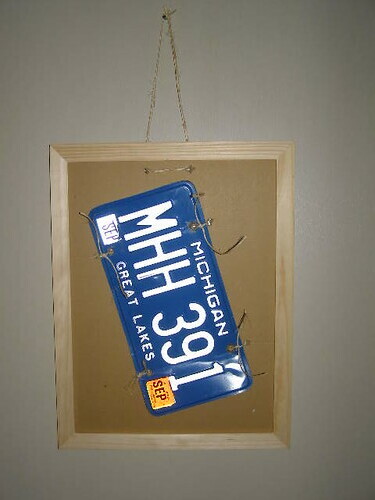 I picked up a cheap frame from Ikea, grabbed some twine, and my scissors. When the time comes, what will you do with your blue plate? Or have you had to ditch it already? The WAB, home to Sunday Crafternoon, put out a call for blue plates so they can decorate the restaurant. Bring in your plate, get a pint. Seems like a good trade! I was thinking of making mine into a display, as well, a la the good old fashioned shadow box. My plate was my very first and I’m fond of the thing. my boyfriend was sad he had to give his up because he’s had it forever and had it memorized. The shadowbox idea seems tired and I thought about making a purse, but that seems sort of.. hard. Not as in difficult, but.. would you want to have a metal thing slamming into your side as you walk? Right now it’s just sitting on my desk, looking all sad and unused. poor plate. I was proud to donate mine to The WAB! Care, you’re a much better person than I am!